Union Minister Arun Jaitley on Saturday said the Modi government has provided a 'scam-free' governance during the last four years, and the country has transformed from being a part of the 'fragile five' to the 'bright spot' on global stage. The focus of the government will now be on consolidation of the initiatives taken in the past, Jaitley said in his Facebook post on completion of four years of the National Democratic Alliance government. In a post titled 'My Reflections on the NDA Government after Completion of Four Years in Power', Jaitley said the preceding 10 years of the United Progressive Alliance rule had unquestionably witnessed the most corrupt government since Independence. 'Prime Minister Narendra Modi created transparent systems through legislative and institutional changes which have given this country a scam-free governance. Unlike the UPA, the Prime Minister is the natural leader of both his party and the nation,' wrote Jaitley, who had undergone a renal transplant earlier this month. 'India has transformed from being a part of the 'fragile five' to the 'bright spot' on the global economic scene. A regime of policy paralysis has been transformed into one of decisions and actions. 'India, which was on the verge of becoming a "basket case" has today been transformed into the fastest growing major economy in the world and is likely to hold that position in the years to come,' he said. The minister said the country's mood from despair has transformed into hope and aspirations. 'Good governance and good economics have been blended with good politics. The result of this has been that the BJP is more confident, its geographical base has become much bigger, its social base has expanded and its winnability has hugely increased. 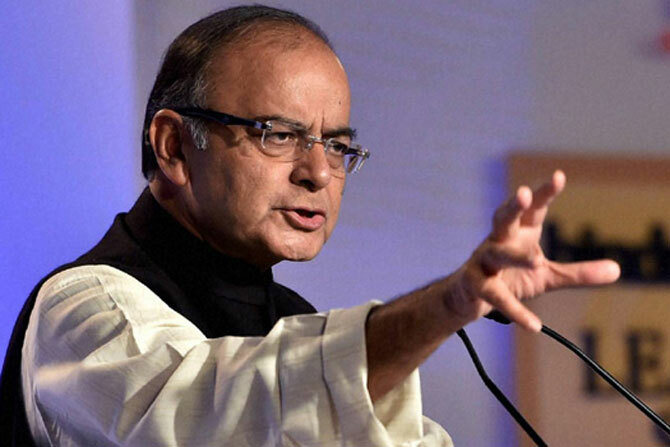 The Congress is in desperation without the perks of office,' Jaitley said. 'Discretions lead to abuse of power because they can be misused. Allocations of contracts, natural resources, spectrum and other Government largesse which were being distributed through discretions, are now allocated through a market mechanism. 'Laws have been changed. Leaders of the industry are no longer seen repeatedly visiting the South Block, the North Block or the Udyog Bhawan. Environmental clearance files don't pile up. FIPB has been abolished,' he said. 'The enactment and implementation of the Goods and Services Tax, the impact of demonetisation, effective tax compliance are all steps against black money, steps which are formalising the Indian economy. The Insolvency and Bankruptcy Code has changed the lender-creditor relationship. The creditors no longer have to chase the debtors. If you cannot pay your creditors, you have to exit through a statutory mechanism,' he said. 'When the global situation became challenging, the UPA's decisiveness and performance collapsed. The last two years of the UPA had witnessed substantially lower growth rates. From the very first year of NDA, India is the world's fastest growing major economy with the highest GDP growth rates. This is also the global projection for the next few years,' Jaitley added. The 'unprecedented' CAD and 'alarmingly high' fiscal deficit showed poor economic management by the UPA. 'Having inherited the mess, the NDA, year after year, has brought it down to 3.5 per cent and shall, this year, try and deliver a 3.3 per cent fiscal deficit. The UPA's economic management was such that even when fiscal deficits were high, expenditure cuts of over rupees one lakh crores were done in order to make fiscal deficit optically look slightly better,' he said. 'The Congress President must remember that taxes don't go into the pocket of the Government. They go back to the people for better infrastructure, better social sector expenditure and poverty reduction programmes. The social sector expenditure has seen a substantial increase by both the Central and the State Governments,' Jaitley said. 'Notwithstanding the perpetual grumbling, last year of the UPA witnessed Rs 5,15,302 crore being transferred to the states. This year the proposed transfer is 145 per cent higher and will be at Rs 12,62,935 crores. This is over and above what the States earn from the GST where they have been constitutionally protected with a 14 per cent annual increase. The States independently levy their own taxes. 'Institutional changes thus being enacted and implemented are putting the Indian economy on a far stronger wicket,' Jaitley wrote.